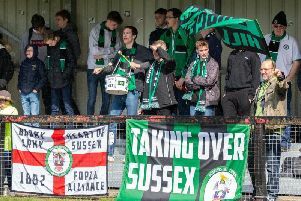 Simon Hull was left wondering how Arundel failed to secure a first SCFL Premier Division success over Crawley Down Gatwick in their opening game at Mill Road this season last night. Mullets were dominant throughout but failed to find a way through a dogged Crawley Down. Forward Ben Gray, fresh from netting his first goal for the club on debut in the opening-day draw at Eastbourne United three days earlier, came closest for Arundel. His first-half effort came back out off the underside of the crossbar, while frontmen Shane Brazil and Harry Russell also had good chances. Mullets had much of the better chances and play for the second game in succession but manager Hull was disappointed his side have failed to come away with victory in either. He said: “The lads were superb. We did everything except stick the ball in the back of the net. “We played some really good stuff and, carved Crawley open at wll in the first period but were unable to find the back of the net. “Ben Gray came closest, hitting the underside of the bar after a ten-minute lighting delay. “The back five were excellent and restricted Crawley Down to one chance of note in the first half. “It was a closer affair after the break but we still created good chances. Shane (Brazil) and Harry (Russell) went particularly close. I’ve got no doubt we’ll play worse and win games this season. The feeling after the game is that it was another two points dropped but I was delighted with the performance and how solid we looked at the back. We kept probing and created really good chances. “There’s a lot of new faces at the club but the signs are positive. A heavy lightning storm in the area forced a ten-minute delay in play after 17 minutes. Mullets came out the brighter after the stoppage, Gray flashing a crisp effort past Crawley Down goalkeeper Sebastian Bos only for his effort to come back out off the underside of the crossbar. Arundel continued to probe after the restart, going close on a couple of occasions as they went in search of a first win. Brazil and Russell were particularly threatening but the home side just could not find a way through. Young Brazil went close to making the vital breakthrough, as did fellow frontman Russell, but Crawley Down hung on to come away with a well-earned point. Arundel’s attention now turns to the FA Cup as they entertain Combined Counties Premier Division Chertsey Town in a extra preliminary round tie on Saturday. ARUNDEL: Stevens; Hallett, Gibb, Dudas, Foster, Noble, Jarvis, Hawkes, Gray, Brazil Russell. Subs: McCauley, Britton, Ebling, Kates, Jephson.